1976 MGB Charcoal Powered NO DINO new build - Charcoal Gasification - Drive On Wood! a lean mixture is used if less power is needed (throttle valve still fully open, just more air than woodgas). Does this mean that when cruising at speeds less than vehicle’s limit, introducing more air into the mixture instead of decreasing the throttle opening may be a possible and preferred? If so, does this also apply when intermittently going downhill? This is what I have notice when running my truck with the auto mixer diaphragm vacuum control that Chris S. built on the 92 Dodge Dakota truck. It seems to run on the rich side normally. I added a 3/4" extra add air line that I can control from my cab. The extra air is mix after the double throttle body at the mixing chamber. By opening this valve I can lean out my woodgas ratio at WOT or remove the extra air when not needed. I still use the 2" add extra air line when doing a full hybrid driving pulling a steep hill. It doesn’t matter if you are running wood or charcoal gasification, the ART of fine tuning the engine or gasifier is needed at times. The other 75% of operating a gasifier. A possible optimum would be a combined quality/quantity throttling of the engine. Til, l have to dissagree on one point. At wot, l always got best power runing slightly lean. As l understand, stoichiometric mixture does create higher temperature/pressure/flame speed, but a slightly lean mix means more air, meaning less gas drag, meaning greater cyl filling ratio. I culd be wrong on the explanation but its a fact a wood burner runs best lean. Similar observations were made by JohanL when he was automating the gas/air mixer via lambda probe. Bob, l think the reason you run rich on the automixer is the fact that a WK makes superior gas. I mentioned before the chemical corelation betweem exess heat recovery and gas quality, and its shown here perfectly. My automixed cold air lmbert always run lean, exept at a sudden throtle release (hydraulic ram wave). I thought it was because the auto mixer mixs a 1:1 ratio and not a 1: 1.2 which is the preferred mix in wood gas. Hi Koen, Kristijan, Til, Bruce, Robert, Wayne. Thank’s Koen for your post for me, looks very interesting! !, and also for all the other posts!! I am in a trip right now, when I get back home I will check all post thoroughly, they seems all very usefull!! Koen: I will like to make some drawing of your gasifier for the pick-up truck. I will totally understand if you do not want to, for any respectfull reazon you may have. Thanks for all your replies, it seems that this a topic interesting for everybody. Possible: definitely yes. Preferred: At least worth a try. Best done with a Mixer, where gas and air throttle are linked together, so there is no need for permanent adjustment. All I wrote above is based on theoretical knowledge of the old books, so it is nice to have a practical proove by you, Bob. Thank you very much Wayne, I very appreciate your comment. At wot, l always got best power runing slightly lean. As l understand, stoichiometric mixture does create higher temperature/pressure/flame speed, but a slightly lean mix means more air, meaning less gas drag, meaning greater cyl filling ratio. I culd be wrong on the explanation but its a fact a wood burner runs best lean. this is the practical experience that I still lack. All I wrote is based on theory. In a running system, there are many different parameters that come together. So lets say optimum mixture for WOT (may it a bit rich or lean). The problem with the automixer is, it compensates for pressure and same amount of both air and gas, but not for caloric value. @TomC , yes, throttle is connected to the pedal. Rich an lean are the secondary air adjustments. You are right, a slightly rich mixture with petrol has an inner cooling effect on the engine. In my post #201 of this topic I submitted to Bruce some calc’s based on your post #49 of your topic : Nozzles for Charcoal gasifier’s. So the Efficiency of the engine filling value of 0.7 @ 4000 rpm I got it from you. So I am confused, what values of engine filling efficiency you suggest us to use?? The chart as mentioned before, together with the spreadsheet, are reference tools, to do some calculations. The 0,7 value is also been used in many other setups/publications, so i use them and i made it a changeable value. Lets call it a “zero point value” for our reference. Now building a gasifier and modifying/inventing/improving is to be hold against zero point values to find out the way your project is going. In my charts there is no mentioning about filter drag, carburator restriction hence the 60mm drag as example value. This to clarify the importance of avoiding restrictions, influences on the engine efficiency. For me, if i use the mentioned numbers, results of calculations in the spreadsheet, i find the sweet spot and my engines work. If i look to my gasifiers, in reference to your question about making drawings, they are all the same principle as a simple fire from Gary Gilmore, a bucket with a hole at a certain hight and a nozzle inserted. Where i might alter the shape of the bucket, the working principle does not change. So, back to the question: which number is correct ? answer: the number that you are able measure and compare against a calculated value. So making a long story short we can say that: the engine filling efficiency you stated of E=0.7 @ 4000 rpm was an ideal theorical top value for an engine with the least restriction: No air filter, minimum carburator restriction, no cyclon, no chargas filter, bigger diammeter and minimum length for the pipe that connects the gasifier with the engine intake, etc. And in the real world, this value will be more close to 0.35 @ 4000 rpm. The starting point for calculating a good engine its efficiency can be the 0,7 yes. Any restriction after that will reduce that number. That is unavoidable, so the less drag the better efficiency, the more power available to the shaft. is it for this reason (to minimize the drag) that you do not preheat the primary air in your gazogene? Sorry for a late reply. Yes a 1:1.1 mix is optimal, but on the lean side meaning usualy any automixed system runs a notch rich. At leats thats what l have in mind can anyone confirm? At wot, l always got best power runing slightly lean. I presume as much for wood gas as for charcoal gas? this awesome mechanism that Chris has presented here could easily vary the richness of the mix! yes, that’s a nice device. It would be also possible to couple the throttle and the air valve via a cam-like mechanism. With this one could get a non-linear opening of the air valve and thus variable gas air mixtures for different throttle positions. An old example is the Gohin-Poulenc mixer. Scroll down until the drawing “Le Melangeur”. 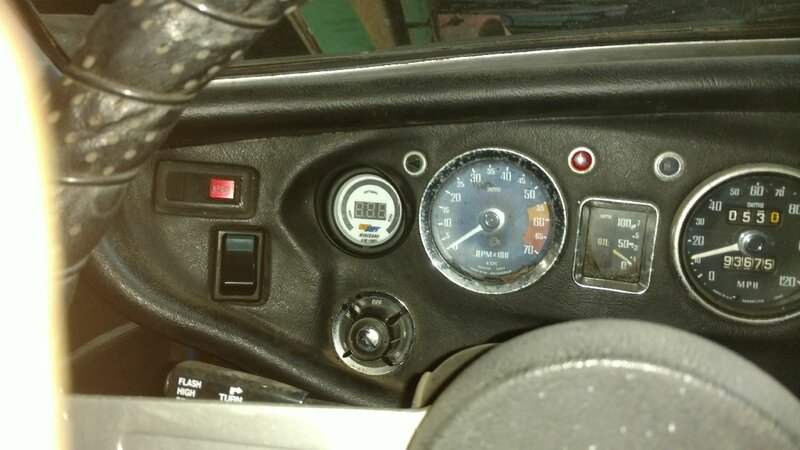 You can see that the air valve is actuated by a cam-like lever to give less air if the throttle is nearly closed and increasingly more air with the throttle opening. It would be possible to use a more curved cam on this mixer to change the ratio in a wider range. A step further would be to just couple a kind of camshaft to the accelerator pedal. Throttle and air valve are both actuated via cams, so a totally independent move of both valves could be realised. I have started a new topic with a collections of my drawings, part list, spec’s sheet, and/or operations procedures, it is call: “Drawings of charcoal gasifiers for vehicles”. In this new topic is included the work I have done for this topic. I finally got around to installing the air/fuel gauge. It fit perfectly where the gas gauge was before. Thanks to those I asked at Argos who recommended this addition. It is definitely easier to watch the gauge than continually going back and forth hunting for the sweet spot. Fortunately my mixing valve hand crank is oriented the same as the gauge–right for rich, left for lean. Now I need to fine tune the EGR and water mist for optimum performance. Since our reactors and nozzles are similar, I am interested in any updates you might have regarding fuel consumption. You mentioned 3 miles per gallon. Are you still getting that on the average? What is the average weight of a gallon of the charcoal you are using? Are you still shutting down when the temperature reaches 350 F at the cyclone exit? What is the greatest distance you have traveled on one filling of charcoal with that shut down temp? Also, how many inches of space is there between the inside bottom of your reactor and the top of the nozzle pipe where the holes are? I’ve been disappointed with the distance I can go on one fill of charcoal. I am thinking of adding a divided disk like yours at the top to guide the charcoal toward the center as the level goes down. I’m sure that adds some additional miles per fill of charcoal. I am probably getting closer to 2 miles per pound of charcoal. I did one easy drive of about 21 miles and my reactor lid temperature was about 300 degrees F. When I got up to 32 miles, the temperature was about 450 degrees F–too hot. I had some damage in my plastic filter section. So, I am changing to more heat resistant materials there and will plan to shut down at around 20 miles in the future.